March 5, 2018 — We are delighted to welcome Aviva Vincent to our team as our new Director of Program Quality. She is charged with expanding and strengthening our programming, particularly in our growing mental health service area. Her experience is uniquely suited to her new position here. 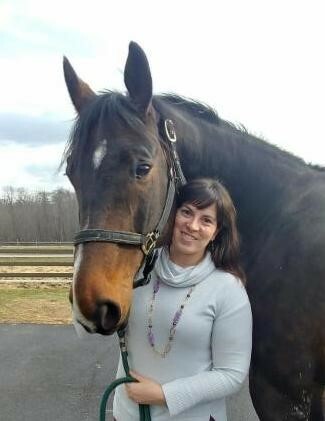 She not only is a longtime horse woman and a PATH certified instructor, she also has her master’s degree in Social Welfare, and is finishing up her PhD in Social Welfare at Case, where she teaches several courses on the power of animal interventions in treatment. “We are excited to have someone with Aviva’s talent, expertise and passion join our team,” says Leslie Mapes, Chief Operating Officer. In the last five years, our work in the mental health area has expanded significantly, and now it is our largest programming area as we serve people with depression, anxiety, PTSD, OCD, ADHD, and people facing crisis such as death of a loved one, a terminal diagnosis, or overcoming addiction, among others. We look forward to continuing to build on our success in this area as Aviva leads our team.